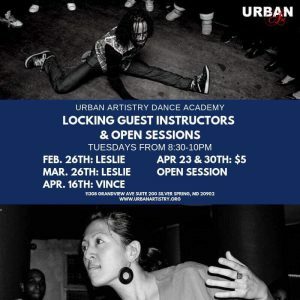 We are now into a new semester at the Urban Artistry Dance Academy, running from April 15 – August 10! Our 2019 class schedule has been updated as well as our class pricing, featuring a new student one week trial for $45! Please note that our Open Session is now on Wednesdays from 10pm-12am and the Memphis Jookin’ class takes place from 8:30pm-10pm on Fridays. Schedule updates to the Locking Class are listed below. Saturday May 4, 12-3pm: Urban Artistry performs at Westfield Wheaton Mall! We will have pop up workshops, dance performances, prizes and more! Come dance with us in front of Macy’s on the first floor! 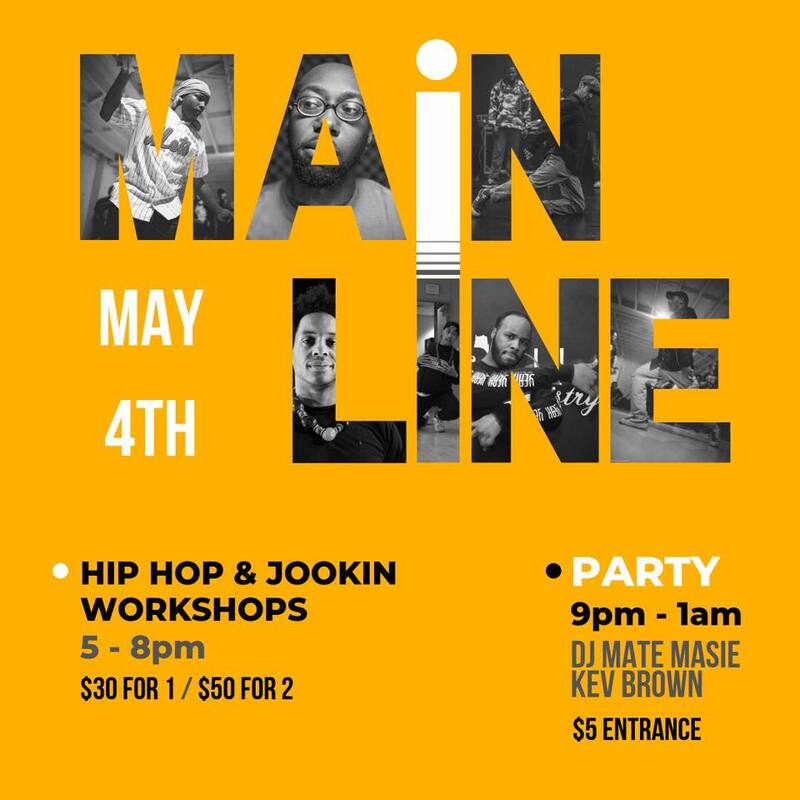 Saturday, May 4, 5-8pm: Mainline Hip Hop & Memphis Jookin Workshops + Party/Jam featuring DJ Mate Masie and Kev Br0wn. $30 for 1 workshop or $50 for both. $5 for the jam only. 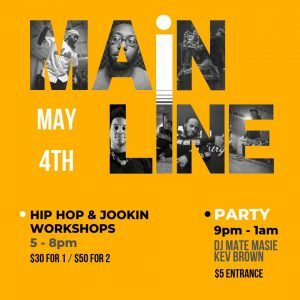 – 9:00 pm – 1am: Mainline Jam! 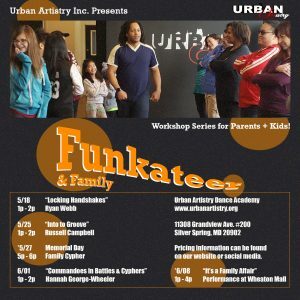 May 18 – June 08: Funkateer Family Workshop Series! Dance is a great connector across cultures and generations. Come dance with a youth that you love! Classes are best for youth ages 7-12, adults of all ages and experience levels are welcome. You can take one workshop or all 3 and get a discount! Register here! 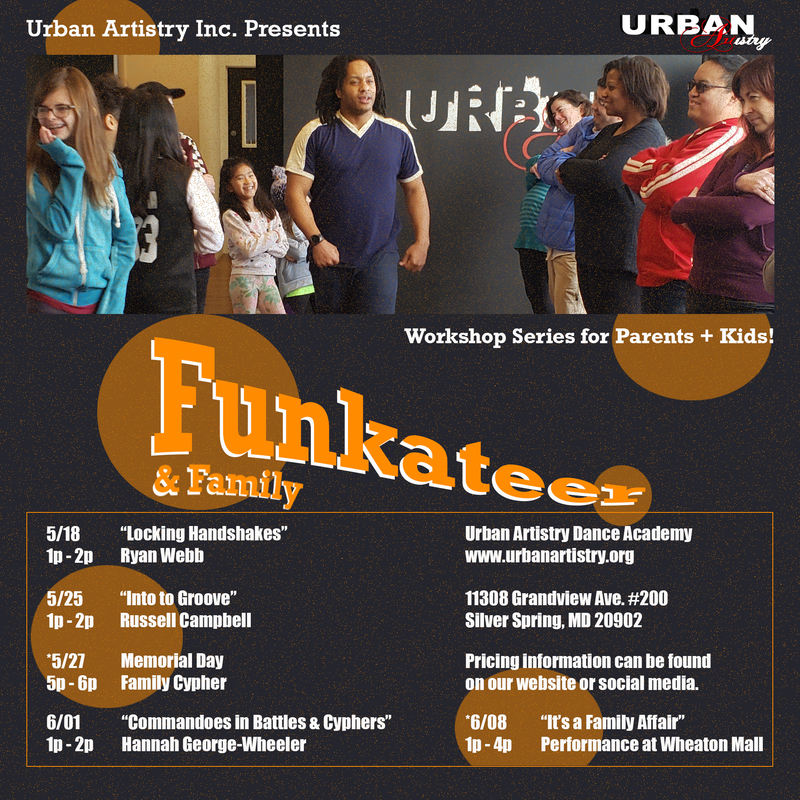 Payment will be processed in-person at the Urban Artistry Dance Academy. Put what you learned into practice! 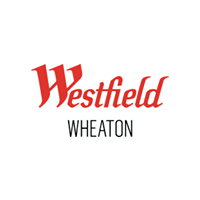 Saturday, June 8, 1-4 pm: Urban Artistry performs at Westfield Wheaton Mall! We will have pop up workshops, dance performances, prizes and more! Come dance with us in front of Macy’s on the first floor! Saturday, June 15 – Sunday, June 23: The International Soul Society Festival! Save the dates for our all ages, week long festival celebrating the full spectrum of Urban Arts Culture here in the DMV! 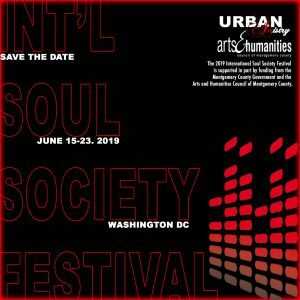 We will have urban dance community members from around the country and around the world to teach, judge, and share their art with the DMV community. Stay tuned for more exciting details to come! Saturday, July 27: Transformations 1 v 1 Open Styles Dance Battle at the Westfield Wheaton Mall! More details to come. 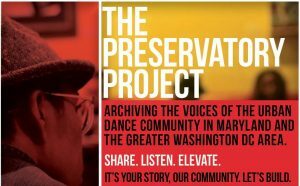 Check out the new face for The Project, the archival of the voices of the urban dance community in Maryland and the greater Washington, DC area. Our studio is just 10 minutes north of the Silver Spring exit off of 495 and a 5-minute walk from the Wheaton Metro. Convenient parking is available. Donate to Urban Artistry via DonateNow! It’s a fast and easy way to support our mission. Did you know that Amazon.com donates to charity? Use your Amazon.com user name and password to sign in to AmazonSmile (smile.amazon.com), select Urban Artistry Inc as your charity, and Urban Artistry will automatically receive a donation from your eligible purchases! Did you have a great experience at our studio? Leave a review for us on Yelp! Urban Artistry, Inc is in part funded by the Maryland State Arts Council.